Turbulence facilitates collisions between particles suspended in a turbulent flow. Two effects have been proposed that can enhance the collision rate at high turbulence intensities : ‘preferential concentration’ (a clustering phenomenon) and the ‘sling effect’ (arising from the formation of caustic folds in the phase space of the suspended particles). We have determined numerically the collision rate of small heavy particles as a function of their size and densities. 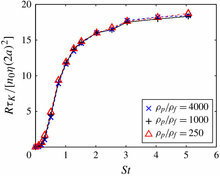 The dependence on particle densities allows us to quantify the contribution of the sling effect to the collision rate. Our results demonstrate that the sling effect provides the dominant mechanism to the enhancement of the collision rate of particles, when inertia becomes significant.